This splendid semi-displacement pedigree yacht proves that comfort need not be compromised when a faster performance is desired. Although PURA VIDA offers an impressive top speed she retains the exceptionally smooth, vibration-free comfort levels and performance for which all Moonen yachts are renowned. 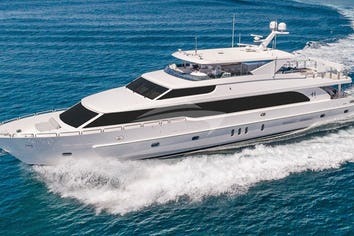 PURAVIDA accommodates 8 guests in 4 staterooms (1 King, 1 Queen, 2 Twins) with 4 en-suitebathrooms. MASTERSTATEROOM: Midships lower deck. Full beam stateroom with walk-around king bed, readinglights, vanity and settee. The ensuite features a spacious shower with rainshower head plus hand wand, bench seat, twin sinks, heated towel rails, head, andcloset. The entertainment system features surround sound HDTV with individualsatellite receiver, and iPod docking station. Port holes in the masterstateroom as well as his-and-her en-suite create abundant natural light ifdesired. Complete blackout option also available. VIP QUEEN STATEROOM: Lower deck, forward: Walk-around queen bed.The en-suite features a stall shower with rain shower head plus hand wand, benchseat, heated towel rail, head, and sink. The entertainment system features a HDTV and iPod dockingstation. TWIN GUEST STATEROOM: Twin beds. The en-suite features a stall showerincluding hand wand and bench seat, heated towel rail, head, and sink. The entertainmentsystem features a HDTV and iPod docking station. TWIN GUEST STATEROOM: Twin beds. The en-suite features a stallshower including hand wand and bench seat, heated towel rail, head, and sink. Theentertainment system features a HDTV and iPod docking station. All staterooms include individual satellite receivers, individualclimate control, robes, hairdryers, and Molton Brown luxury bath products. AFTDECK: Covered, al fresco dining at a square teak table incorporating a benchseat and 6 additional chairs to comfortably accommodate 8. Full wet bar withfridge and sink, and iPod docking station. Access to the swim platform. Passarelle for Med-style boarding.Underwater lights. Walk-around decks to bow. SALON: ample seating with comfortable sofas and club chairs. The entertainmentsystem has surround sound, HDTV, and iPod docking station. The dining table is situated on the starboardside adjacent to the galley and seats 8. FOREDECK hosting a magnificent semi-circular shaped seating area. A private space to enjoy the spectacular sunsets! Nic, who grew up in the south east of England, has been in the yachting industry since 2013. Since her early years she has been brought up around water and quickly learned to love everything it has to offer. With a love for the ocean and a keen interest in marine conservation, she completed a 4-year Zoology degree at the University of Manchester. Wanting to focus her studies towards marine conservation and with a love for travel, Nic undertook a 6-month placement as a research assistant studying the dolphin population in the Bay of Plenty, New Zealand - which in turn also provided her first opportunity to live and work on the water. After graduating and then stepping into the retail world for a year, at a British chocolate company, Nic was then given the opportunity to step into the yachting world. She began her career as a stewardess onboard a busy 130ft charter yacht, giving herself and her husband Jordan the chance to work together. Having gained the valuable skills and the experience necessary to provide an exceptional service to guests, herself and Jordan were then giving the chance to establish and run their own program onboard Pura Vida as a Stewardess and Captain team for the past year. Excited to welcome you onboard and show you all PV and her crew has to offer, Nic will ensure your vacation is one to remember. Telana was born and raised on a farm in a small town in the Northen Cape next to the Orange River, South Africa. Growing up, she had a great interest in cooking and food and would help out at restaurants, where her big love for cooking began. Telana studied at the Institute of Culinary Arts, Stellenbosch and went onto work for four years in Cape town under some of South Africa’s top chefs. Following her studies and restaurant experience, she decided that she wanted to travel the world but still be able to do what she loves, so she pursued a career as a chef onboard a private yacht. Telana has been working as a yacht chef since 2016 and enjoys the opportunity it provides for expanding her culinary experience and knowledge. Having traveled extensively through Asia, she has a flair for Asian/Thai cuisine but loves experimenting with new foods and sharing her delicious meals with guests onboard. While on charter, her meals are influenced by the location and tries to incorporate local food if possible. In her spare time, Telana like to stay active and enjoys tennis, swimming, canoeing, river rafting, trail walking and skateboarding. She also enjoys learning new languages and speaks English/Afrikaans. Paulo began his yachting career at the age of 17 on commercial dive vessels in Australia and has since gained extensive experience in the luxury yachting industry. 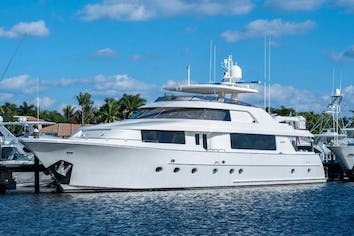 Paulo has built a strong reputation over the past 11 years for running highly successful charters in a professional yet relaxed manner throughout the Caribbean, East coast USA and Mediterranean. 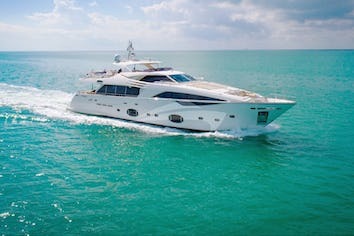 Most recently known from the ever popular charter yacht Sweet Escape boasting a 90% return client basis with continued superlative feedback from all. Light hearted, friendly and always with a smile captain Paulo will endeavour to make your trip onboard Pura Vida a truly memorable occasion. When not on rotation, Captain Paulo enjoys time with his wife and two daughters in Australia.